We were eating fewer apples until we started slicing them. Where are we going? To behavioral nudges. Economists from Cornell wondered why elementary and middle school students were not eating their apples. Cafeterias had tried making them cheaper but sales had not increased. When schools implemented the FDA mandate to include some fruit in every lunch, the kids threw it out. The Cornell group suspected the problem was that an apple is tough to eat. For smaller children with braces it can be uncomfortable and messy. Meanwhile, middle schoolers–especially the girls–could feel uncomfortable chomping into an apple. Suspecting that the children might feel very different about sliced apples, the Cornell group arranged for three school cafeterias to receive commercial slicers that they used on every student’s apple while three other schools served as a control. The results were unequivocal. 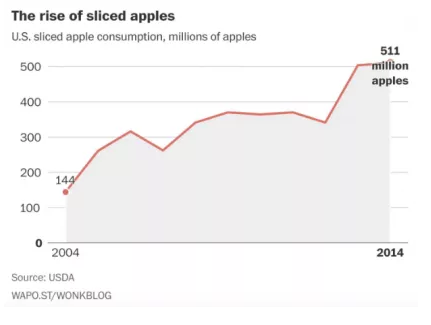 In the schools with the slicers, daily average apple sales were up 71% and, with 73% of the children eating more than half an apple, waste was way down. Economists would call apple-slicing a nudge. Defined as decision-making approaches that “steer people in a certain direction,” nudges relate to economics because they can affect our demand curves and government regulations. Hoping to shape behavior, the British and U.S. governments have even appointed nudge units. Is #2 or #4 the nudge that encourages apple-slicing?